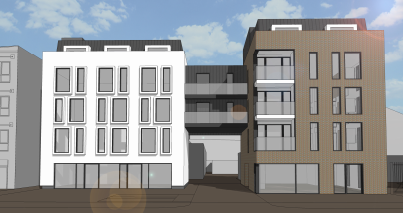 An application for planning permission for two linked 5-storey buildings has been submitted for the derelict former Elf petrol station on Brixton Hill. The scheme is a mixed use scheme, with ten studio/office units and eight residential units on the upper floors, with no homes deemed ‘affordable’. The developer is also offering a financial contribution to the upkeep of Windmill Gardens, as well as an agreement that residents would not be eligible for residents’ parking permits in order to reduce the burden on local parking. Residents can make comments or object to the scheme online here. This entry was posted in Blog and tagged Brixton Hill, planning, Windmill Gardens by Martin Tiedemann. Bookmark the permalink.